Day 1: All Aboard Panamania! We had a full day in Costa Rica and many ringers chose some adventurous shore excursions like zip-lining over the rainforest canopy or white water rafting on the Pacuare River. 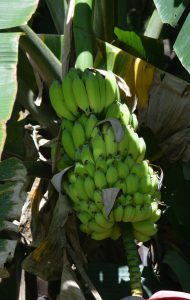 Most excursions included a drive-through of a banana plantation. Bananas are one of the top exports from Costa Rica and between 10-15% of the world’s bananas are grown in the Caribbean side of Costa Rica. 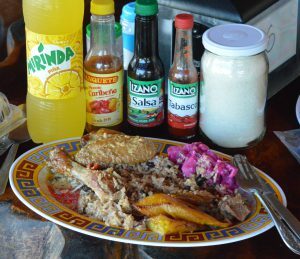 The photo below is a typical roadside cafe lunch of chicken, potato/beet salad, and a regional rice dish seasoned with coconut milk. The Zuiderdam Executive Chef Vinod Patil joined our table for dinner tonight. The senior officers of the Zuiderdam rotate to different tables each evening so many passengers get the opportunity to speak with the ship’s senior leadership. 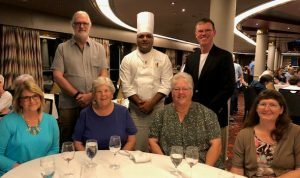 Chef Patil is from Mombai, India, and has been with Holland America for about 20 years, working on several ships in his career. He skypes with his wife and 2 daughters nearly every day when he is at sea. In describing some of his daily executive duties, Chef Patil said that he does a lot of tasting and managing, but sadly not as much cooking anymore. Today’s culinary challenges were (1) finding grits for tomorrow’s breakfast and (2) counting 1500 lobster tails for the final gala dinner.